Spring is here and even in hot humid Houston it’s…well it’s nice. The weather, at least for now, is not brutal yet and feels like spring with cool evenings and days that are not stiflingly humid. 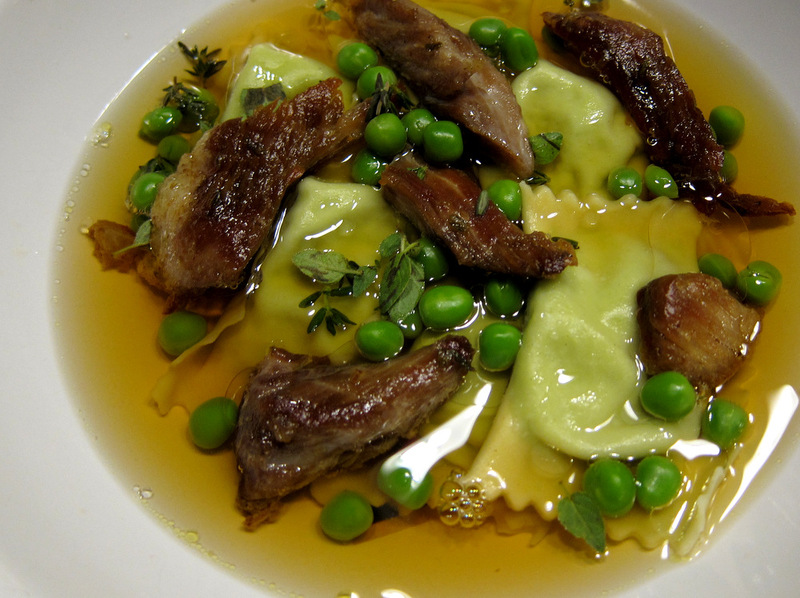 This dish is a good bridge between winter and spring. It combines lovely deep flavored “braised” pork and it’s crystal clear consomme with that emblem of spring, bright green peas. This meal was a result of buying a whole untrimmed pork shoulder. This includes several muscles that can be separated and treated differently as opposed to the traditional American method of just slicing through the bone and slow-cooking everything (as in barbecue). 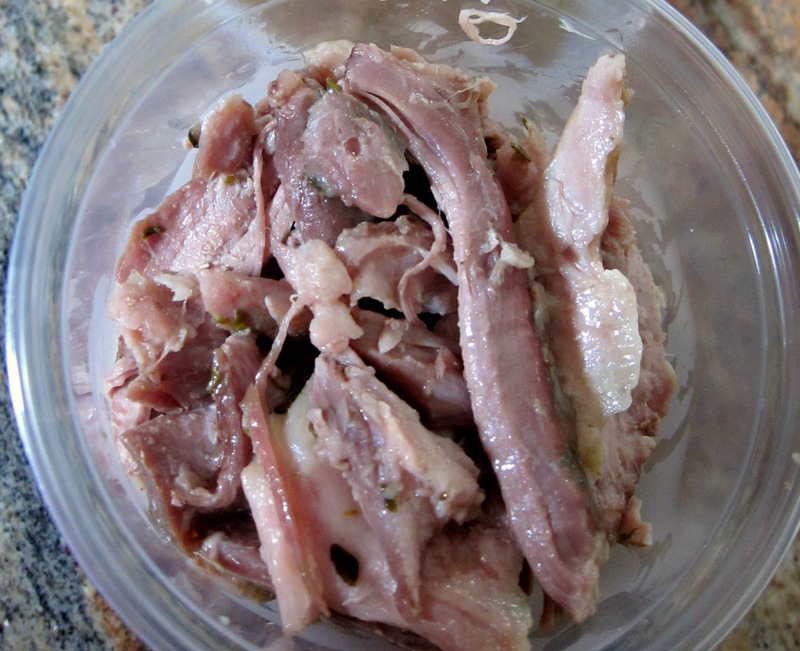 My purpose was to harvest a whole Coppa which is a cylindrical muscle that is usually cured and air-dried. Then it is served like most Italian whole muscle salumi, sliced thin and enjoyed on its own, as part of a simple composed plate or on top of a pizza. This type of butchering meat is known as seam butchery and is practiced a lot in Europe. Its intention is to leave the muscles whole and divide up the animal’s quarters into manageable pieces without cutting through the bones much or at all. 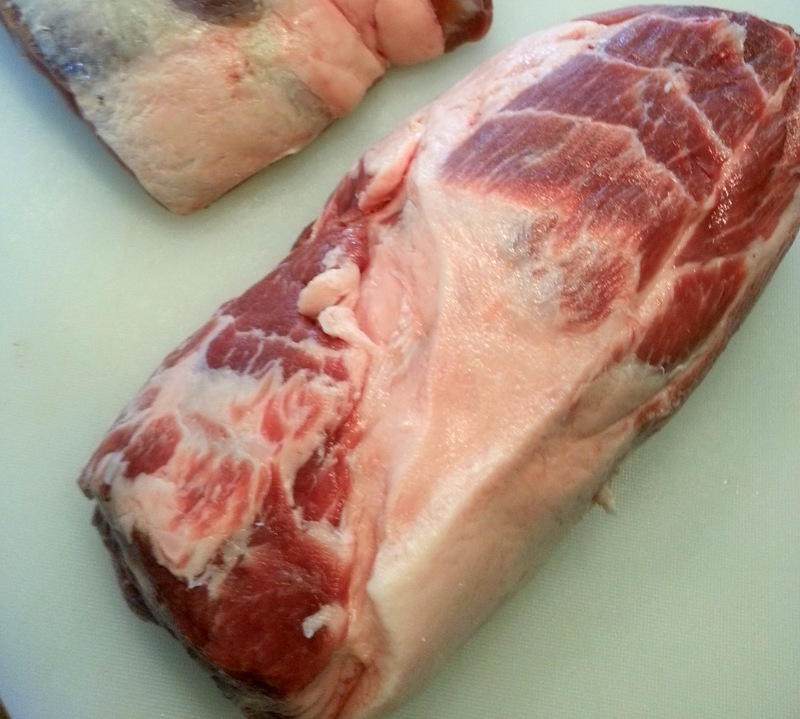 I ended up with a lovely looking Coppa (picture above) that is curing right now. The Coppa has a great shape and really good marbling in it that it got me thinking about doing this again but cooking the muscle instead of curing it. Really it is like a pork loin but with more fat running through it. How bad could that be? After butchering the shoulder I also ended up with a few other nice muscles including a flat one that looks a lot like a thick skirt steak. I believe this is what sometimes is called a Pluma. That’s what I used for this dish. As soon as I finished butchering the pork shoulder I tossed the flat piece with some salt and a touch of sugar and let it rest in the fridge. I figured I’ll cook it sous vide with a bit of lard and go from there. Not sure what to do with the meat one it is cooked (tacos are always a good option anyways) I also took care of the resulting shoulder bone. Not wanting it to go to waste I roasted it well along with an onion cut in half until deeply browned. I deglazed the pan with Madeira and then Sherry vinegar, scraped all the browned bits and tossed all that into a pressure cooker. I added more aromatics and water and made a superb pork stock. Now I got a perfectly cooked piece of pork along with a few cups of delicious pork stock. Let’s mangle those two ideas togehter and see what comes out. Ramen? that could work, but I was not sure I wanted a stock flavored with Madeira and Sherry vinegar in that. 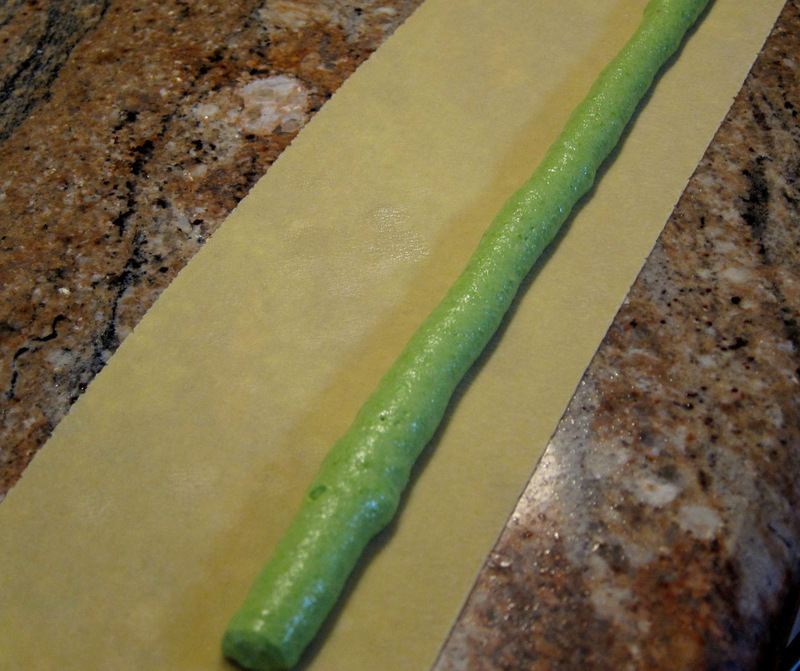 I like the noodle idea though. I started looking for something more European. Maybe a fresh pasta tossed with the pork? I could shred the pork. Pour some of the stock into the served pasta bowls? That sounds good. 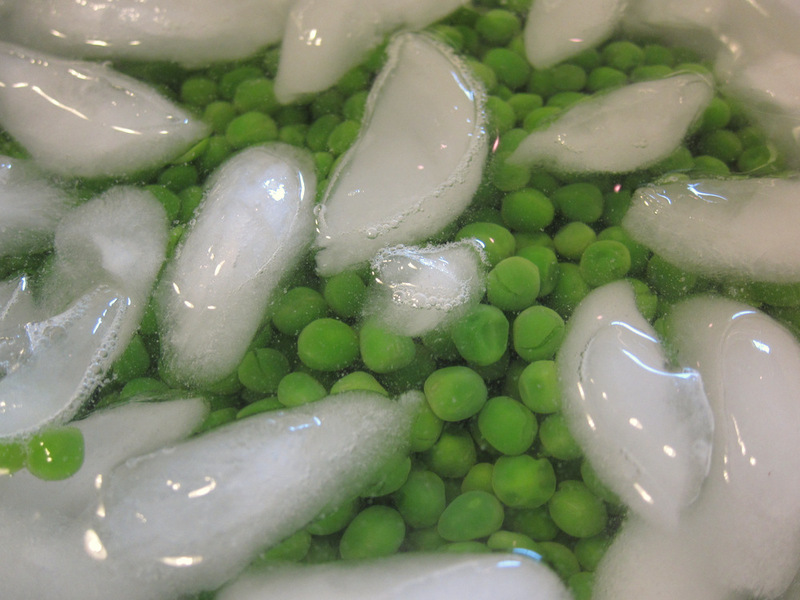 Toss in some peas? Yeap! Maybe make it a bit more refined though. I also have that ricotta in the fridge that needed using…. So I jotted down my initial idea that at one point included making a roulade out of the pork and slicing it to serve, similar to this venison dish. I abandoned that down the line. Crisping the pork chunks in a touch of lard would work and look better as well as give me some great texture. 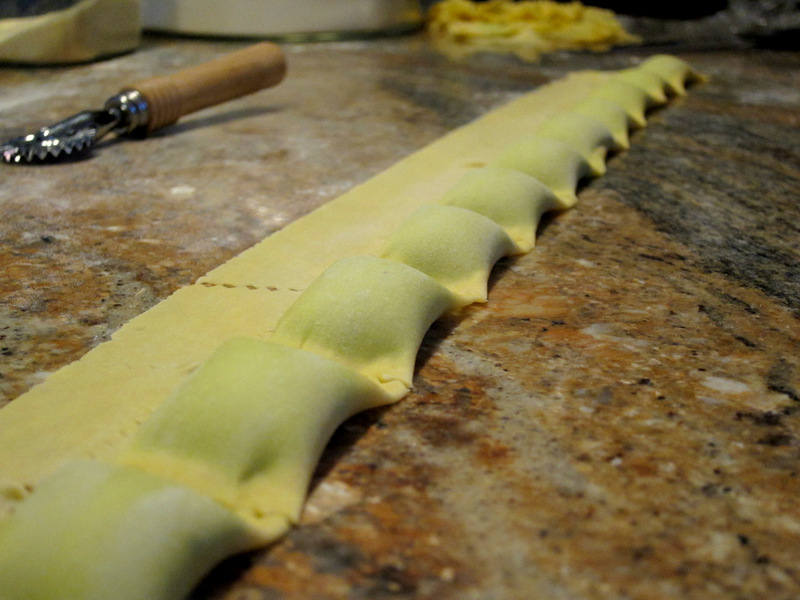 The agnolotti though stuck. The idea of pasta pillows filled with a ricotta-pea mixture contrasting with the flavorful consomme and the crispy pork was irresistible. 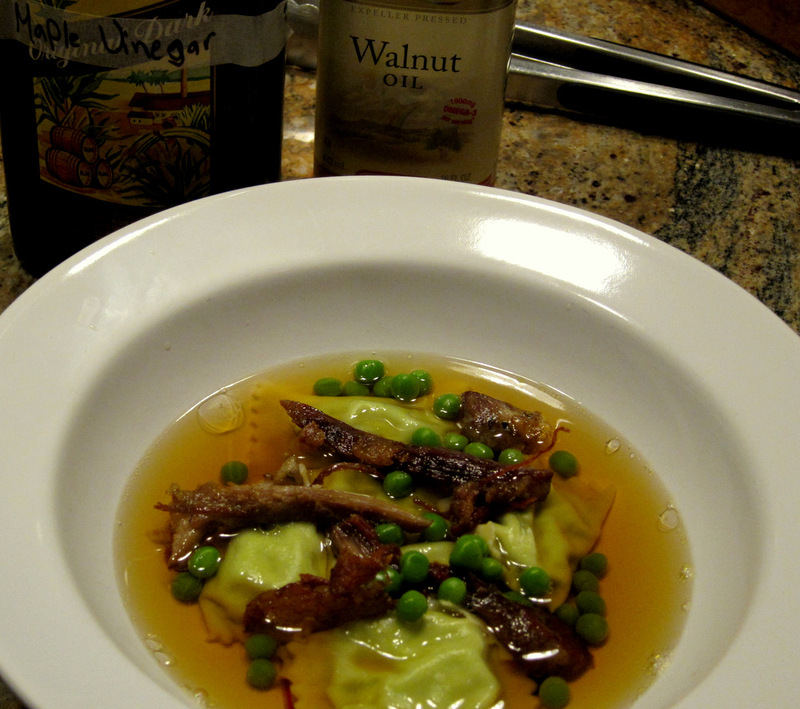 I have made those French Laundry-style dumplings a few times since I first posted about them here and now they have become much easier to prepare. 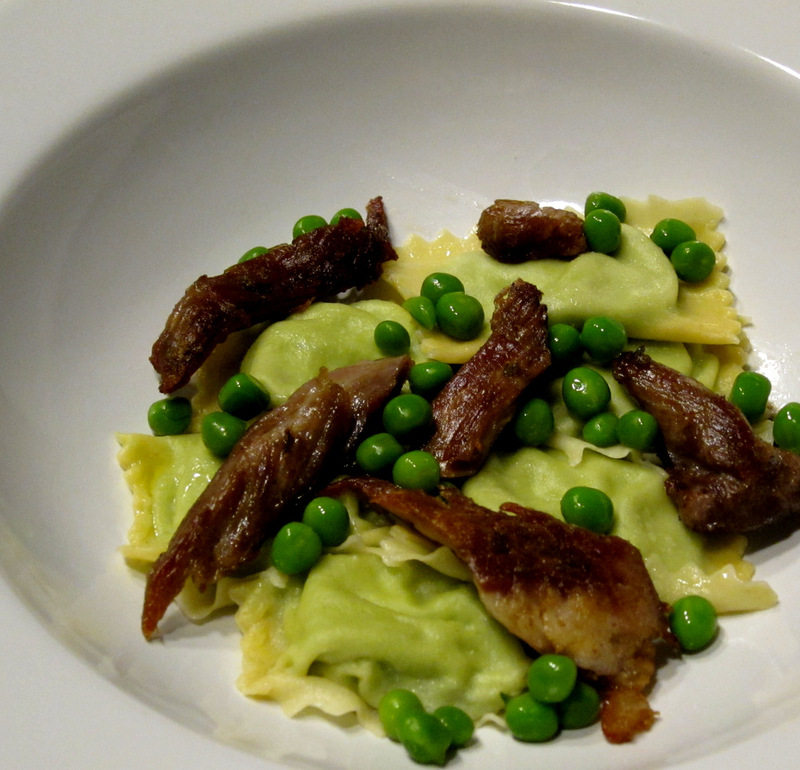 The filling is a bit based on the recipe in The French Laundry book for fava bean filled agnolotti and it includes the peas (blanched and shocked in ice water), ricotta as well as a bit of fine fresh breadcrumbs to give it more body. 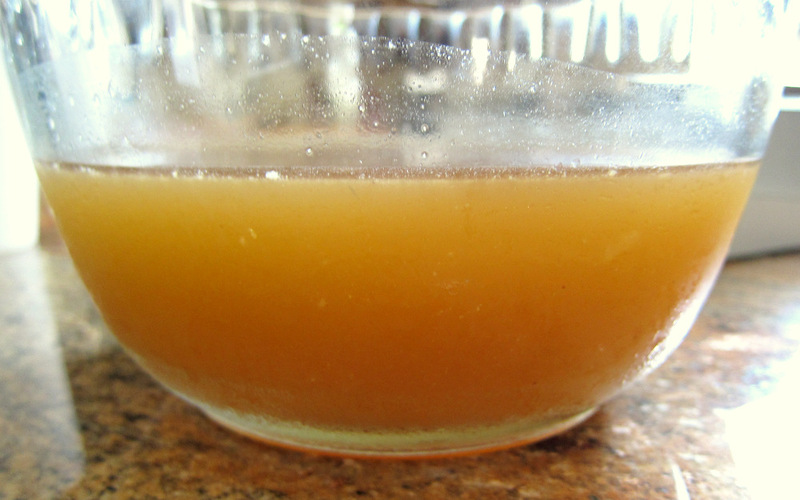 Since I wanted a more refined dish I decided to make a clear consomme from the pork stock as opposed to leaving it as is, delicious but slightly “cloudy”. It would still taste great but just would not look as nice. 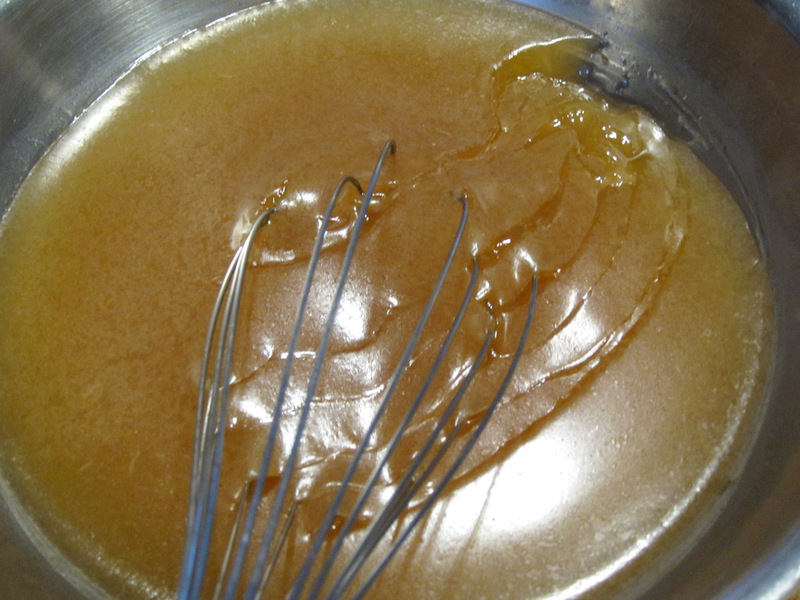 The traditional method for making consomme is the one from the Escoffier days or earlier. It involves whisking egg whites, ground meat and some vegetables into the stock. 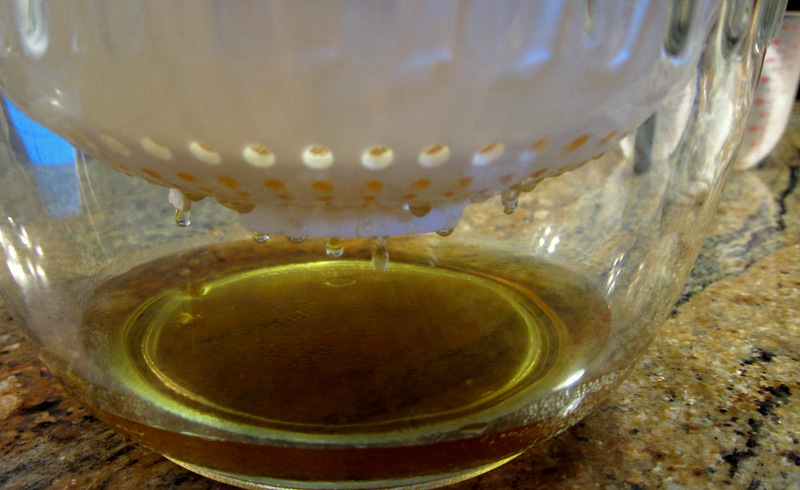 This coagulates and forms a “raft” that traps all impurities and you strain off the clear stock. I opted for the more modern and much less labor intensive Agar clarification. I first learned about it from Dave Arnold’s Cooking Issues blog and posted about it before. 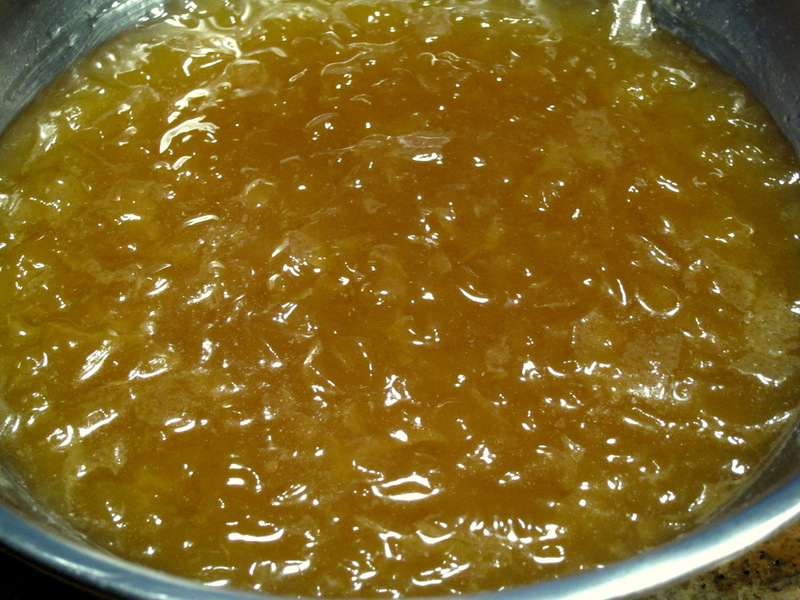 The idea is to gently set the liquid with agar then, through a cheese cloth, squeeze and strain the clear consomme leaving all impurities stuck in the Agar web. I recorded my before and after weights for the stock to see how much I would lose and I started off with close to 750gr of stock. I ended up with around 500 gr of clear consomme. Not a bad yield for a very easy method that produces crystal clear result and pure flavor. To plate, I served the boiled dumplings and topped them with chunks of crispy pork. I added some reserved blanched peas to the plate as well. 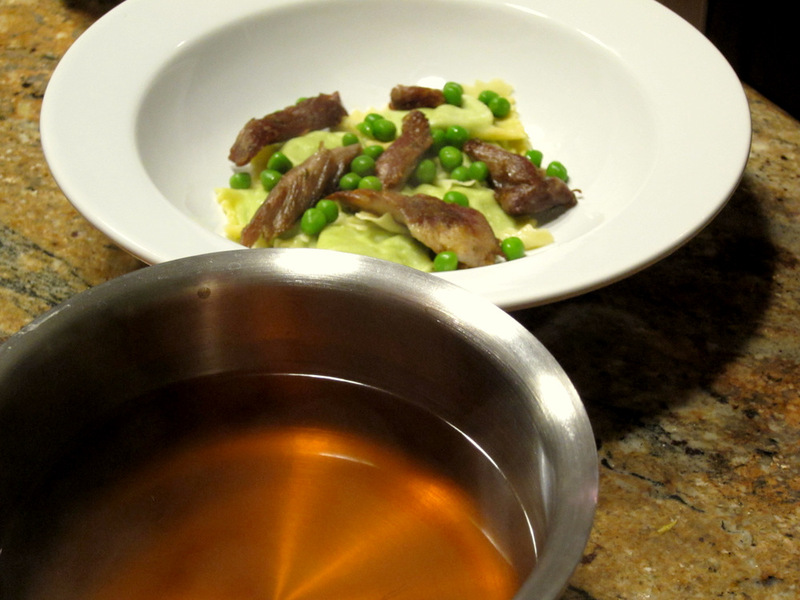 Then I heated up the consomme and seasoned it with salt and maple vinegar before pouring it around and over the pasta and pork. As a last touch I added a few drizzles of walnut oil and fresh thyme leaves. Wow it is the first time I read about making consommé with agar. Would have to try this method! Thanks for sharing it! Definitely give it a shot. very simple and works great. As usual great recipe and great photos. I like your way of thinking about a dish. I’d never heard of the agar clearing method. That sounds very interesting, thanks for sharing. I also like the idea of making my own coppa, but doesn’t that need to cure for a really long time? 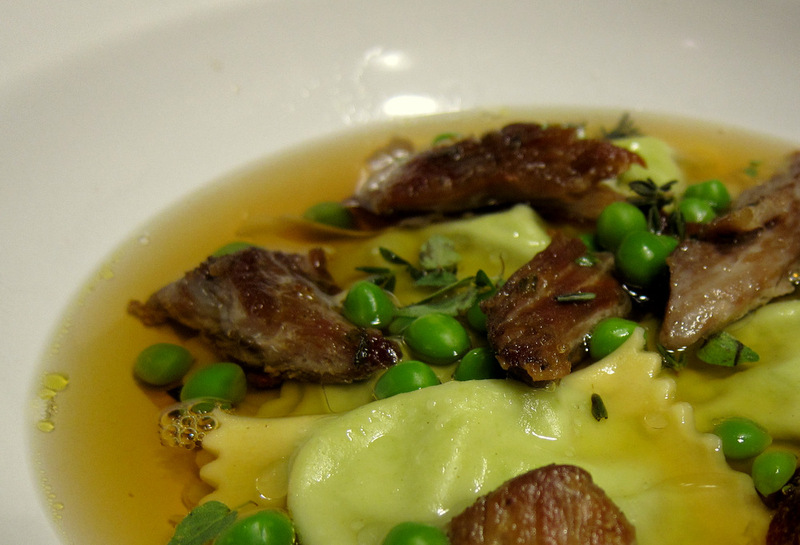 The combination of pork stock with pea ravioli and crispy pork sounds great. Of course you would correct my pasta terminology :-). 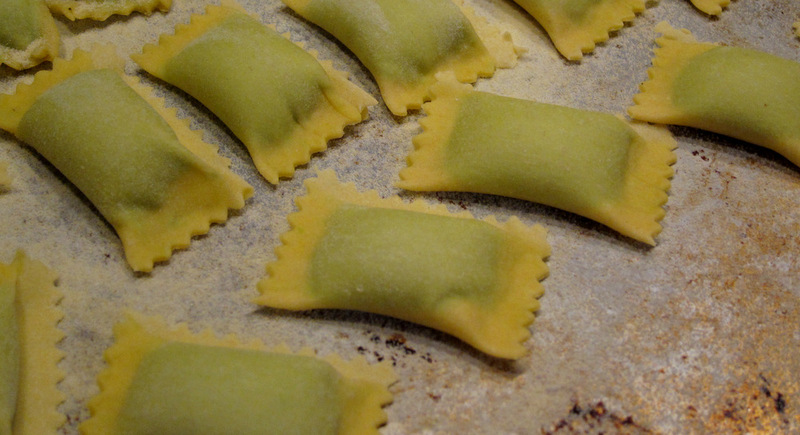 Yeah, I call them Agnolotti just based on the recipe from The French Laundry but I totally understand that this might be chef using “artistic licence”. The Coppa is easy to make but, you are right, it does take time. Almost all of the time is waiting though for it to finish curing and drying. This one took two months exactly to be ready. I am hoping to post something about it here at some point soon.